Foxing is a band that sort of blindsided myself and others. Arriving with not much notice, and yet significant hype, their debut LP is already on a second pressing, that is going fast. What differentiates Foxing from all of the other hyped up new coming bands, is that they are in no way derivative of what is "popular" or "cool" in the moment. Yes, Foxing has some "emo" elements and post-rock moments, but the band never ends sounding like a rip-off or watered-down version of something else. 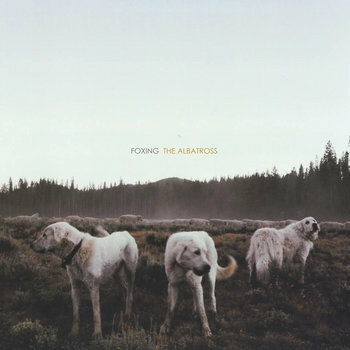 The Albatross is an album that stands by itself, and fully supports its ideas and themes. Tracks flow together and sequencing is spot-on. The album is one that is meant to be listened to in full, in one sitting, and by doing so it can be appreciated more. Vocals are light and packed with emotion, yet unique. There is never any whining or yelling just for the sake of it. The songs are constructed with purpose and lyrics and vocals accentuate the power behind the music. Foxing plays a mixture of what could be described as indie/post-rock meets newer "emo." Guitars are clean and crisp, and feature somewhat angular lines. Songs swell around these guitars, and build and bloom with them. They create a sound that is both fresh, yet familiar, and gives the band a respectable amount of credibility. The album has multiple moments of highs and lows. From the sensible opening of "Bloodhound," with it's quiet build, to the brooding dwell of "Rory," The Albatross is purposeful and meaningful. Standout tracks include the melodic "Inuit," with a mesmerizing groove, and worming vocal lines. It's songs like this that showcase the band's unique energy and prowess. Words float around the poignant guitars, which feel alive and drive the songs. Steam is lost a tiny bit near the end of the album, where tracks tend to bleed into each other a bit too much, but that does not hurt the whole package much. The more emotional, compact front end of the album tends to hurt the end in that aspect, and it feels more like a slow descent halfway through, compared to fast rise of the beginning. While The Albatross is not a perfect disc, it is a wonderful debut that feels like a prequel to something much greater. One can only imagine the roads that a band like this can take on a follow up and it opens to so many pathways. Foxing will be a band to look out for, and their future only looks brighter from here on out.